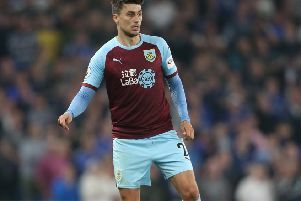 Sean Dyche has backed Rouwen Hennings to shine at Turf Moor. Hennings is in line to start at home to Reading with record signing Andre Gray touch and go with a hamstring problem. The former Germany Under 21 international was top scorer in Bundesliga 2 last season with Karlsruher SC, and here are five of his best goals. • Hennings proud to be part of Clarets set up!